A four-axis SCARA type and a versatile picker join Engel’s line. 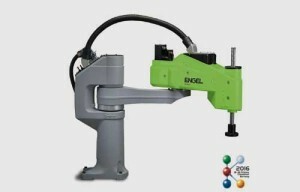 Engel Austria (U.S. office in York, Pa.) is expanding its robot line at the upcoming K 2016 show in Dusseldorf in October. One new entry is an addition to the easix line, which currently consists of six-axis articulated-arm robots. For pick-and place, stacking, and palletizing applications, a new four-axis SCARAversion (below left) offers much higher speed at lower cost. Based on Staubli technology, the SCARA robots can be fully integrated into the CC300 injection machine controller.